Professor Mark P. Del Mastro of the Department of Hispanic Studies has been appointed Secretary-Treasurer of the Mountain Interstate Foreign Language Conference (MIFLC) effective January 1, 2018, which makes the College of Charleston the new legal seat of the organization. Founded in 1951 and with an annual conference each October, MIFLC is is an organization of teachers, scholars, and graduate students dedicated to the advancement of literary, linguistic, and pedagogical scholarship in foreign languages. The College of Charleston hosted past MIFLC conferences in 2003 and 2015, and Dr. Del Mastro is past President of the same organization. The establishment of the Race and Social Justice Initiative (RSJI) was a direct response to the murder of Walter Scott and the massacre at Mother Emanuel in 2015. These tragedies were only the latest evidence of anti-black violence in Charleston County, part of a long history of white supremacy in the Lowcountry since the seventeenth century. To capture the racial disparities that emerged out of this history, RSJI commissioned a comprehensive study of racial inequality at the local level, which they recently released in a report titled “The State of Racial Disparities in Charleston County South Carolina 2000-2015.” This report reveals the massive disparities between African Americans and other racial groups in Charleston County, pointing to the ways in which white supremacy is embedded in the very structures and institutions that are designed to protect and support the county’s residents. The findings combine statistical data and a critical analysis of structural inequalities along racial lines, focusing especially on income, housing, education, health, and policing. 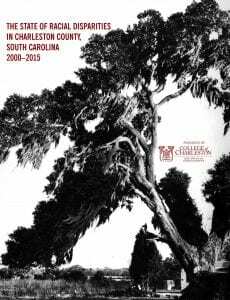 In addition to describing and analyzing the contours of white supremacy in Charleston County, this report also offers policy proposals for addressing these disparities. 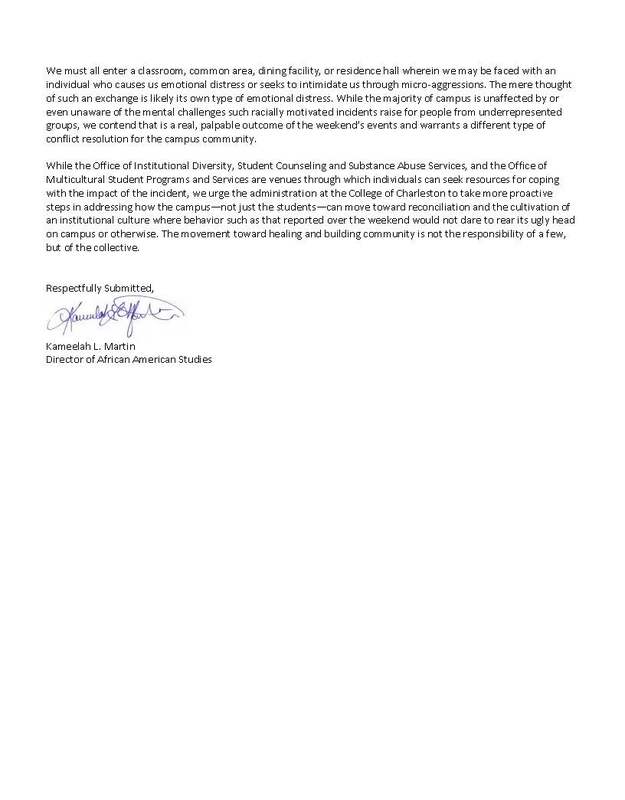 Our hope in African American Studies is that these findings, as disturbing as they are, prompt the College of Charleston and Charleston County to confront these underlying issues of racial inequality with the fierce urgency and compassion they deserve. Black people in Charleston County earn 60% of what their white counterparts make. Forty-two percent of black children under age 18 are living below the poverty line, compared to 11% of white children. Of more than 22,000 traffic stops in 2014 in North Charleston that did not result in a citation or arrest, 16,730 involved African Americans—almost 76% of stops, much higher than the city’s black population. Most of those (10,600) involved black men. During the 2014–15 school year, K–12 suspensions in the Charleston County School District (CCSD) totaled 8,018; black students, who make up a little more than 40% of the student population, were 6,636 (83%) of those suspensions. The black population in Charleston experiences poorer health for a wide-range of health indicators than any other racial/ethnic groups in the region.These include greater rates of obesity, infant mortality, diabetes, cancer, chronic respiratory problems, and death from numerous conditions including heart disease, cancer, stroke, and diabetes. 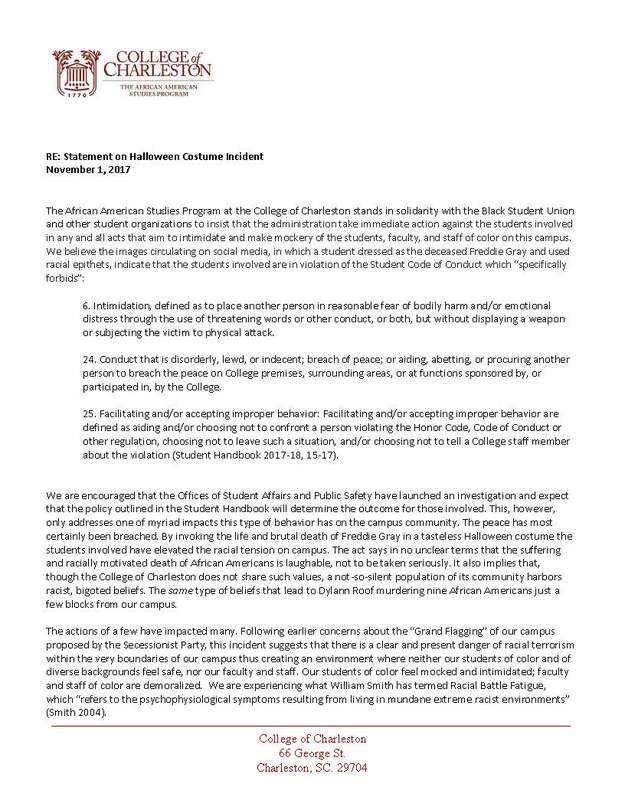 On Saturday, November 4, 2017 at Winthrop University, Professor Devon Hanahan gave a keynote address during the Joint Fall Conference of the AATSP of the Carolinas.